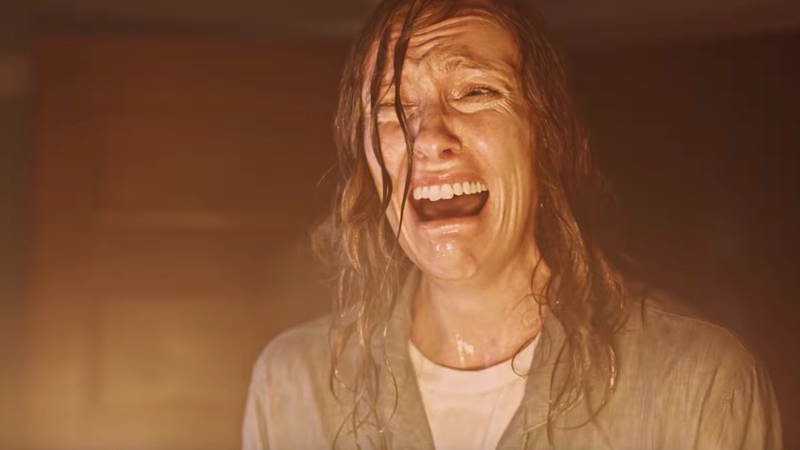 Home Blog Why Is 'Hereditary' So Scary? Why Is 'Hereditary' So Scary? "Hereditary" is sparking conversation around the country as audiences try to comprehend it all. Some thoughts on why this is one of the great horror movies. There’s an old trope in horror movies where characters in a school classroom discuss a topic thematically related to the movie. Remember Laurie Strode (Jamie Lee Curtis) looking out the window of her high school English class at the figure across the street as the teacher drones on about the subject of fate? "What Samuels is really talking about here is fate,” the teacher says. “You see, fate caught up with several lives here. No matter what course of action Collins took, he was destined to his own fate. In Samuels' writing, fate is immovable like a mountain. It stands where man passes away. Fate never changes." So it is with poor Laurie Strode, who encounters her own unavoidable fate in the form of serial killer, Michael Myers. In Ari Aster’s “Hereditary,” the young son, Peter, sits in his high school English class listening to lectures about Sophocles and Greek tragedy. Discussing Iphigenia, the teacher asks the students if it is more tragic for someone to cause their own downfall due to a fatal flaw or if that downfall was predestined and the character never had control over their own fate? Here, it feels as if the Graham family never had a choice – a chance to change their own miserable fate. The movie proficiently blots out any sense of hope that audiences may have for these tragic players: mother (in an astonishing and grueling performance by Toni Collette), father (played by a somber, grounded, and soft-spoken Gabriel Byrne), son (played with heartbreaking bewilderment by Alex Wolff), and daughter (played by a dead-eyed Milly Shapiro). The hype generated by this movie has been kind of a wonder to behold and undoubtedly pure gold for distributor A24. After its opening weekend, a debate has formed among audiences, who were simultaneously rattled and perplexed by the movie touted by Time Out New York as “this generation’s ‘The Exorcist.’” That’s hardly an apt comparison since “Hereditary” is a far more feeling movie than “The Exorcist” could ever hope to be. Did any of us really feel any sense of sympathy when little Regan vomited up pea soup and spun her head around or did we just get our demonic thrills? “Hereditary” makes you feel bad for the family, which is in a state of decline throughout the movie. Let’s forget about the supernatural elements of this movie for a moment and consider how this movie proceeds on an emotional level. That is where the movie shines, like a dark star. A key sequence in the film involves a sudden tragedy that audiences are made to feel on a visceral level. You feel it in your gut. That sequence (you’ll know it when you see it) is absolutely critical to the overall horror of “Hereditary,” which is otherwise derivative of materials we have seen before, including J-horror ghost stories, mood pieces like Jack Clayton’s “The Innocents,” and imagery-dense horror like Kubrick’s “The Shining.” During this sequence, a single image unexpectedly flashes on the screen (again, you’ll know it when you see it) and is accompanied by the sound of agony, the likes of which we rarely hear in modern horror films. Together, image and sound make for a truly disturbing and horrifying moment. That moment sticks with us throughout the remainder of the movie. The shocking and painful reality of it sinks in and never goes away. What could be more horrific than the real and very plausible reality of family tragedy? There’s a level of horror here that audiences probably weren’t expecting or were even ready for. It’s not a fun or entertaining kind of horror, but more like a sickening dread that doesn’t let up. And, actually, that sense of dread settles in from the very beginning. There is a noise – a constant low rumble that permeates the soundtrack of the movie. It underlies many of the early scenes. You almost don’t notice it, but if you pay attention, it’s there, like an aural presence that places you on edge. Structurally, the movie is a progression of scenes that have almost none of the usual payoffs of modern American horror. In most commercial features, a character will hear or see something offscreen and set out to investigate. The scene builds up to climax, typically a jump scare. That’s not the case with “Hereditary.” In fact, in most scenes, there is no payoff at all. We simply wait... And wait... And wait. There’s a certain prickly pleasure in that kind of dreadful anticipation. This is a patient film. A quiet film. An unnerving film. Scary isn’t quite the right word for it. Disturbing, yes. Creepy, god yes. It’s a mood piece, creating tension and unease and ratcheting up the feeling until it’s unbearable. The ending may leave you feeling dissatisfied, but in a sense, the ending is hardly the point. You need some sense of dramatic relief after all the build-up, and in that sense, the ending is quite perfect in its bizarre inexplicableness. There are no easy answers to be found here and no revelations that tie up all loose ends in a neat and tidy bow. Though "Hereditary" is a meticulously crafted movie, it is unafraid to be ambiguous. Confounding, even. You never get your footing in this one, even after you leave the theater and head home that night to try to get some sleep.